"We're all in the end-of-our-life book club, whether we acknowledge it or not; each book we read may well be the last, each conversation the final one." Visibly Lit is the Rebel Heart Books book club dedicated to graphic literature. Led by industry pro, lifelong artist, and animator, Jeff Johnson, we can promise you two things about this book club: it's not your grandma's, and you're going to love it. Visibly Lit meets the 1st Monday of every month at 6:30pm. Bestselling romance authors, Megan Crane and Maisey Yates, lead the Romance Rebels in exploring the much-maligned romance genre. If you're on the fence or, "don't read romance," we challenge you to expand your horizons and lean in to discovery - be a rebel! The Romance Rebels meet the 2nd Monday of the month at 6:30pm. The Book Brave book club is an all access exploration of excellent literature. Fiction or nonfiction, we promise each selection will make you think, stretch your imagination, and challenge your preconceived notions. Rebel Heart Books is proud to grow community around literature and the written word. Here are some non book club ways you can get involved. Offered throughout the year, Rebel Heart Talks Books is an invitation to our community to join us in discussion on a wide range of topics relevant to the book world. Jeff Johnson, a founding member of the original Drink & Draw Social Club, brings the event to the Rogue Valley with Rebel Heart Books. Artists, wannabe artists, art-lovers, drinkers, and more are invited to join us every first Thursday at 6:30pm. In gratitude for your support, Rebel Heart Books offers a frequent buyer program: The Rebel Hearts Club. Pick up a punch card and get a punch every time you spend $20. Collect 10 punches and receive a free mass market or trade paperback book of your choice! 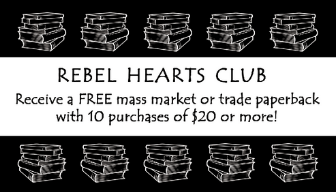 Ask about The Rebel Hearts Club the next time you're in the store!